Your doctor has diagnosed you as having carpal tunnel syndrome and the workers’ compensation insurance carrier has denied the claim. Do you want to know why? 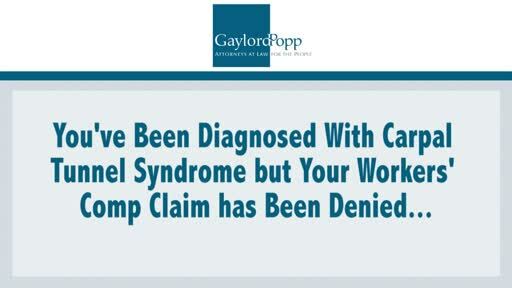 I’m Sam Gaylord, a disability attorney specializing in the areas of workers’ compensation, social security disability, and disability pension appeals in the state of New Jersey. The reason your matter has been denied is because it’s considered an occupational claim. That is, it did not happen on a specific day at a specific time. So it’s easy for the workers’ comp insurance carriers to deny that kind of claim and require you to provide the proof necessary to prove your claim. In addition, it’s easy for them to deny because they save money. Although it’s a work-related claim, and although you should be entitled to benefits, they’re going to deny that so they can attempt to save money. In order to win, what you’re going to have to do is provide medical documentation that what you’re doing at work has caused that condition or that what you do at work aggravates or accelerates or exacerbates an underlying or pre-existing condition that you may already have had. If you have additional questions as a result of this information, I encourage you to pick up the phone and give me a call at 609-246-0669 or you can send me an email at sgaylord@gaylordpopp.com. Thank you for watching.